Crisis, chaos and The Ultimate Foe (1986) | Randomwhoness: a Doctor Who blog by Johnny Spandrell. Sampling stories in random order. It’s a Monday morning in 1986. Doctor Who producer John Nathan-Turner, aged 38, sits restlessly in his office, smoking not-his-first cigarette of the day. Also in his office, a lawyer who’s been seconded from some dry and dusty corner of the BBC to witness the forthcoming meeting. The lawyer looks around JN-T’s office, filled with Doctor Who paraphernalia and wallpapered with showbizzy photos, and imagines that this is not going to be an ordinary day at the office. An awkward silence ensues as they wait for the meeting’s other attendees to arrive. 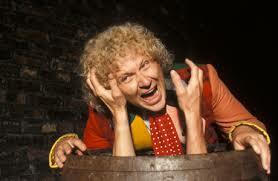 JN-T has been producing Doctor Who for six seasons, and he’s used to crises. He’s pulled stories out of oblivion, he’s saved doomed shoots, he’s made the unworkable work. Last year when his series was effectively cancelled, he resorted to leaking torrentially to the newspapers and whipping up a media outrage to force his bosses to back down and reinstate the show. But nothing compares to the mess he finds himself in as the last episodes of Season 23 loom. His script editor, Eric Saward – the only other ongoing staffer on the program – has resigned in acrimony. JN-T is now doing his job as well as his own. Over the last year, he and Saward have been supervising the making of the longest Doctor Who story in history; fourteen episodes of The Trial of a Time Lord. But the two have clashed over the story’s climax and Saward, who was writing the final episode, has withdrawn permission for its use. JN-T needs a new script which concludes the longest and most complicated narrative the show has ever seen, at a time when its survival has never been more precarious. And he needs it in a week. As he stubs out one fag and lights another, perhaps he wonders how he got to this predicament. The show’s hiatus was a blow, but at least it offered the production team time, a luxury they rarely had in the past. Plus they had 12 fewer episodes to produce this year. Where had all that time gone? How had it all fallen apart? In this sort of crisis, a producer usually turns to his script editor. But that’s no longer an option. What JN-T needs is someone who can work fast, who knows the program, who knows the Trial and who’s crazy enough to take the brief. Writers are few and far between. The great Robert Holmes who wrote Parts 1-4, has died. Philip Martin, writer of Parts 5-8, could be around. After that, the ranks are thin. But JN-T has a writer in mind. In fact he has two. The meeting’s hitherto absent participants had at last arrived. The producer’s face flushed, matching his Hawaiian shirt. He rushed to answer the door. There stood an elderly looking couple. From Doctor Who: A Script in Time (unpublished), Target books, 1987. So JN-T explains the situation to the Baker Twins. Part 13 is written and ready to go, but he can’t use Saward’s Part 14. In fact they can’t even discuss it for fear of being accused of plagiarism, hence the presence of the lawyer. Locations are secured, cast are booked. Shooting starts next week. Can they write a new Part 14? To their merit, Pip and Jane don’t run from the room. Nor do they refuse what sounds like an impossible task. They say yes. And off they scurry to do the work. The lawyer heads off for a coffee and a cake. JN-T allows himself a brief sigh of relief, lights another ciggie and starts script editing Parts 9-12. Written by Pip and Jane Baker. And as far away as Australia, news of the production debacle is spreading. Young Spandrell reads an issue of fanzine Data Extract with a lyrical headline: Holmes dies, Saward quits, Brigadier returns. Like most fan news of the time, it proves to be partially correct. Born out of chaos, The Ultimate Foe feels chaotic. How could it not? This 55 minutes of television has a total of four writers between it. Holmes wrote the first half of Part 13, and it’s solid enough, delivering the season’s two big revelations: that the Time Lords destroyed Earth and that the Valeyard’s a future version of the Doctor. Saward wrote the rest of that episode, plunging the Doctor into the nightmare world of the Matrix. And it’s good stuff, producing some of the most memorable images of Colin Baker’s tenure, such as the set piece where he’s sucked into a beach. P&J attack Part 14 with gusto. Their solution to the problem presented is incident. Part 14 has its characters embroiled in incident after incident before it ends with the Valeyard attempting to let off a big bomb. Inspired it’s not. What’s most obviously missing is a big confrontation between Doctor and Valeyard, with all those future regenerations at stake. Perhaps it ends with a moment of ruthlessness from the Doctor which shows us that his journey towards becoming the Valeyard has begun. But anyway, Pip and Jane delivered an episode which has never ranked among the series’ worst (they saved that for their next story), nor its best. But sadly that’s what the series really needed at this point. Still completing that episode with all its predetermined strictures in record time, is a considerable achievement, one the Bakers are rarely given credit for. Years ago, someone interviewed them for DWM and in a smarmy little trick to end his piece with, asked the bemused pair was a ‘megabyte modem’ was, throwing a particularly lame piece of dialogue from this episode back at them. The elderly couple of course, had no idea what he was talking about, having no doubt long forgotten the exact wording they misused in a script decades ago. What a cheap, rude way to treat these people. Yes, they indulged in awkwardly pretentious dialogue and preposterous concepts, but on this occasion they saved the show’s bacon and produced, I think, their best work on the show. So credit where it’s due, and come back with your cheap jibes when you can write your way out of a mess like Trial. LINK to Robot: Holmes worked on both, script editing one and co-writing the other. That works for our next story too. NEXT TIME… It will be the end of everything, even your pension! We germinate The Seeds of Doom. Which is interesting, given the Trial ends on a cliffhanger which was never resolved or touched upon later. The Valeyard is still alive, and is seemingly the Keeper of the Matrix. I’m glad Season 24 ran far away from Season 23, but what an odd note to end 14 weeks on.